Abbreviations: PSD, Postsynaptic density protein; NAP, neutrophil-activating protein. 14 R. Golser, A. C. Gorren, A. Leber, P. Andrew, H. J. Habisch, E. R. Werner, K. Schmidt, R. C. Venema, and B. Mayer, J. Biol. Chem. 275, 5291 (2000). 15 H. Ju, V. J. Venema, M. B. Marrero, and R. C. Venema, J. Biol. Chem. 273, 24025 (1998). 16 S. R. Jaffrey and S. H. Snyder, Science 274, 774 (1996). 17 S. Cao, J. Yao, T. J. McCabe, Q. Yao, Z. S. Katusic, W. C. Sessa, and V. Shah, J. Biol. Chem. 276, 14249 (2001). 18 S. R. Jaffrey, A. M. Snowman, M. J. Eliasson, N. A. Cohen, and S. H. Snyder, Neuron 20, 115 (1998). 19 D. S. Bredt, Proc. Soc. Exp. Biol. Med. 211,41 (1996). 20 G. Garcia-Cardena, R. Fan, V. Shah, R. Sorrentino, G. Cirino, A. Papapetropoulos, and W. C. Sessa, Nature (London) 392, 821 (1998). 21 H. Ju, R. Zou, V. J. Venema, and R. C. Venema, J. Biol. Chem. 272, 18522 (1997). 22 O. Feron, J. B. Michel, K. Sase, and T. Michel, Biochemistry 37, 193 (1998). 23 J. P. Gratton, J. Fontana, D. S. O'Connor, G. Garcia-Cardena, T. J. McCabe, and W. C. Sessa, J. Biol. Chem. 275, 22268 (2000). 24 G. Garcia-Cardena, P. Martasek, B. S. Masters, P. M. Skidd, J. Couet, S. Li, M. P. Lisanti, and W. C. Sessa, J. Biol. Chem. 272, 25437 (1997). polypeptide that interacts with NOS2, and inhibits its activity by regulating NOS2 homodimerization. However, these methods have been used by others to identify proteins that interact with the other isoforms of NOS as well. 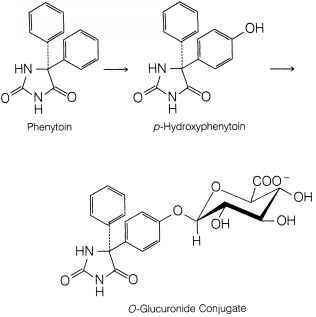 Techniques to identify protein-protein interactions involve methods that are either relatively specific or relatively sensitive. Coimmunoprecipitation of interacting proteins from mammalian cells is more specific, but may fail to identify proteins that interact with the target at low affinity (false negatives). The yeast two-hybrid system is more sensitive, but may include proteins that do not actually interact with the target (false positives). We have employed the yeast two-hybrid system to screen several cDNA libraries for polypeptides that interact with NOS2. To eliminate false positives obtained by screening in yeast, we then rescreened potentially positive clones expressed in mammalian cells by coimmunoprecipitation. The yeast two-hybrid system is a method of genetic screening that relies on the interaction of two fusion polypeptides to form a GAL4 transcription factor from its separate modules.25 Yeast are first transformed with a bait plasmid encoding a polypeptide consisting of NOS2 fused to the GAL4 DNA-binding domain (GAL4-BD). These yeast are then transformed a second time with a plasmid library consisting of random cDNA fragments fused to the coding sequence of the GAL4 activation domain (GAL4-AD). If the fusion polypeptide consisting of GAL4-AD-cDNA interacts with GAL4-BD-NOS2, the GAL4-AD polypeptide is physically linked to the GAL4-BD polypeptide, and can activate a reporter gene. Yeast expressing reporter genes are expanded, and the cDNA obtained from the cDNA library plasmid is isolated. 25 S. Fields and O. Song, Nature (London) 340, 245 (1989). cDNA prepared with Moloney murine leukemia virus (Mo-MuLV) reverse transcriptase and oligo(dT)-primer is inserted into the HybriZAP-Gal4-AD k vector (Stratagene, La Jolla, CA). The resultant pGal4-AD-cDNA library plas-mids encode fusion proteins consisting of the GAL4 activation domain and random macrophage polypeptides. The titer of the primary unamplified two-hybrid cDNA library is estimated as 1.6 x 106 plaque-forming units (PFU). The two-hybrid cDNA library is first excised from A phage in the presence of ExAssist filamentous phage (Stratagene). The library is then amplified by introduction into XLOLR Escherichia coli cells to a final titer of 3.3 x 109 colony-forming units (CFU). This produces a library of plasmids containing cDNA fragments upstream of GAL4-AD. The plasmids encode a fusion polypeptide consisting of a library of polypeptides fused to GAL4-AD. One critical step in designing interaction experiments is to choose the appropriate target. Using the entire protein as a bait may not be the optimal strategy. For example, a screen of proteins interacting with the entire NOS2 polypeptide as bait ultimately yielded only calmodulin, which has a high affinity for NOS2 (our unpublished data, 2000). However, a screen for proteins interacting with selected domains of NOS2 yields other polypeptides but not calmodulin, as described below. We have constructed a bait plasmid by ligating fragments of NOS2 3' to the GAL4-BD. Murine NOS2 cDNA sequences (1-549 or 1-210 bp) are prepared by the polymerase chain reaction (PCR) and inserted 3' to the cDNA for the GAL4-binding domain of plasmid pGal4-BD (Stratagene). The resultant pGal4-BD-NOS2 bait plasmids encode a fusion protein composed of the GAL4-binding domain and an amino-terminal fragment of NOS2 (amino acid residues 1-183 or 1-70). This produces a plasmid encoding a fusion polypeptide consisting of NOS2 fragments fused to GAL4-BD. We have used the two sets of plasmids to screen for polypeptides that interact with the amino-terminal domain of NOS2. YRG-2 yeast cells are cotransformed with pGal4-BD-NOS2 and the HybriZAP-Gal4-AD cDNA library, and grown on a selective medium lacking tryptophan, leucine, histidine, or combinations thereof. Colonies that contain cDNA encoding target library proteins interacting with the bait fusion protein are identified by transcription of the HIS3 and lacZ genes. In our experiment, 1.4 x 106 yeast transformants were placed under selection. Approximately 50 cotransformed yeast clones were able to synthesize histidine. These 50 were screened for the ability to make /i-galactosidase (ft-Gal), revealing 18 clones that could synthesize both histidine and /i-Gal. Plasmids from these 18 -Gal-positive yeast colonies were isolated and retransformed into competent E. coli DH5a cells. Analysis of these plasmids revealed that four clones contained overlapping cDNA sequences encoding a 110-kDa protein, which we called 110-kDa NOS-associated protein (NAP-110). In vitro analysis of protein-protein interactions can be used to confirm interactions detected in yeast.26 In vitro analysis can also be used to determine the domains of proteins responsible for interacting with other proteins. 26 J. Estojak, R. Brent, and E. A. Golemis, Mol. Cell. Biol. 15, 5820 (1995). 27 E. A. Richard, S. Ghosh, J. M. Lowenstein, and J. E. Lisman, Proc. Natl. Acad. Sci. U.S.A. 94,14095 (1997). 28 S. Ghosh, T. Pawelczyk, and J. M. Lowenstein, Protein Expr. Purif. 9, 262 (1997). 29 S. Ghosh and J. M. Lowenstein, Gene 176, 249 (1996). of supernatant is incubated with 10 /zl of normal rabbit serum for 30 min, and then incubated with 50 pi of protein A-Sepharose 4B for 30 min. After centrifu-gation, 500 pi of supernatant is incubated for 3 hr with primary antibodies, and then with 40 pi of a 50% (v/v) suspension of protein A-Sepharose 4B (or goat anti-mouse agarose) for 4 hr at 4°, and washed three times with 1 ml of cold 20 mM Tris-HCl (pH 7.4), 125 mM NaCl, 1 mM Na3V04, 50 mM NaF, 1 mM EDTA, 0.2% (v/v) Triton X-100,0.2 mM phenylmethylsulfonyl fluoride (PMSF). Samples are boiled with sodium dodecyl sulfate (SDS) and 2-mercaptoethanol, fractionated by SDS-polyacrylamide gel electrophoresis (PAGE), and transferred onto polyvinylidene difluoride (PVDF) membranes. Membranes are incubated for 1-2 hr at room temperature with antibodies to iNOS2, washed, incubated for 1-2 hr with goat anti-mouse or goat anti-rabbit antibody coupled to horseradish peroxidase, and visualized with an enhanced chemiluminescence (ECL) reagent (Amersham, Arlington Heights, IL). Coimmunoprecipitation experiments reveal that NOS2 physically associates with NAP-110 in mammalian cells. Negative controls include noninduced RAW cells. Additional negative controls include peritoneal macrophages isolated from NOS2 null mice. These experiments confirm the data derived from experiments in yeast: NAP-110 interacts with NOS2. To determine whether NOS2-associated proteins regulate NOS2 activity, we cotransfect HeLa cells with expression plasmids for NOS2 and expression plasmids for interacting proteins.5'10 Accordingly, we next explored the effect of NAP-110 interactions with NOS2. 30 C. J. Lowenstein and S. H. Snyder, Methods Enzymol. 233, 264 (1994). Fig. 1. 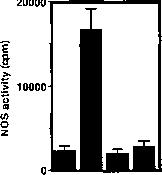 NOS-interacting protein inhibits NOS activity. HeLa cells were transfected with empty vector alone, vector expressing NOS2 alone, vector expressing NAP-110 alone, or vector expressing NOS2 plus vector expressing NAP-110. Lysates of these cells were assayed individually for NOS2 activity.